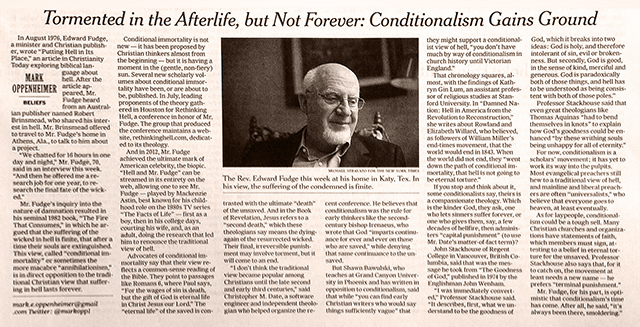 Recently, New York Times journalist Mark Oppenheimer wrote a piece entitled Tormented in the Afterlife, but Not Forever: Conditionalism Gains Ground, in which he discussed the Conditionalist movement, and interviewed both Edward Fudge and our own Chris Date. Now that is high visibility! And in one of the more notable responses to the NYT article, president of Southern Baptist Theological Seminary Al Mohler made some obervations on Conditionalism in his daily podcast The Briefing. I have a confession to make: I adore and respect Al Mohler. Every morning, I listen to his daily podcast on my way to work—and love it. His Christian analysis of news and events is thoughtful and proactive. He’s not just responding to the latest noise from the media, but discussing important milestones, trends, and thought patterns in society. So let us respond to Dr. Mohler’s points individually—may meaningful dialog commence! 1. Why is the secular New York Times interested in this? The first most interesting aspect of this development is the fact that the New York Times thinks this is interesting. You’re talking about a secular newspaper writing to a secular readership. In Romans 1 we are told that God implanted the knowledge of himself in the consciences of every single human being. Augustine referred to this when he made very clear that in every single human being is a hunger – a quest – to know God that may be misdirected but cannot be extinguished. And when you look at the moral consciousness that God implanted in every single human being, it cries out for a resolution of judgment. And that’s why many modern secular people may say they do not believe in God and they do not believe in hell, but they can’t stop thinking about hell nonetheless. However, he is missing a much more important motive for the interest in hell in particular, namely that for the many thinking Americans who do see themselves as Christian and do desire to belong to God, the doctrine of hell is a huge stumbling block, a painful and embarrassing one which violates what common intuition tells us about justice and the character of God. Advocates of conditional immortality say that their view reflects a common-sense reading of the Bible. They point to passages like Romans 6, where Paul says, ‘For the wages of sin is death, but the gift of God is eternal life in Christ Jesus our Lord.’ The ‘eternal life’ of the saved is contrasted with the ultimate ‘death’ of the unsaved. Well you look through this and you come to understand that the effort to try to redefine hell is actually not very new. In his magisterial three volume history of Protestant liberal theology in the United States, Gary Dorrien of Union Theological Seminary points out that the earliest sources of heresy in the American theological tradition had to do with the doctrine of hell. Let’s face it, the slippery slope argument is almost always invalid, and is typically based on the unwillingness to develop a nuanced and sophisticated set of rules to mitigate the risk of sliding, while allowing liberty at one pole of an argument for the few special cases. In rare instances, such as the Gay Marriage debate, one can demonstrate a good slippery slope argument in that the logic for one edge case demands allowing in all others. The exception is when you can define criteria that, for example, exclude those other cases from sliding in (i.e. “On what basis do you approve of gay marriage but can exclude polygamy, group marriage, or incestuous marriage?”). But such cases are rare. So to see Dr. Mohler resort to this is embarrassing. While I admit that this could be true, a correlation could exist for two reasons. First, people can initially take offense at the doctrine of hell, beginning to trust their own intuitions on the matter more than the scriptures, and so become theologically liberal. In this case, you could indeed argue for causation. But a second, better explanation is that the traditional doctrine is such an affront to our intuitions on justice, that many people are driven to exegetically investigate the traditional view and easily arrive at Conditionalism without needing to liberalize their view of scripture. However, upon encountering an intolerance for such exegetical liberty within more fundamentalist Christian circles, they end up taking refuge within more liberal circles. As a result, measurable data on how many evangelicals actually hold to Conditionalism is difficult to obtain, compared to liberal movements where it is much more visible. Of course, the Unitarian movement was a theologically liberal movement that wanted to do away with hell. But that doesn’t mean that the Conditionalist desire for a more biblical view than ECP is theologically liberal. Most evangelicals are aware of the rise of higher criticism as part of the late 18th century, and the resulting emergence of Christian Fundamentalism at the turn of the following century. That liberal movement, and the horrors of WWI and WWII forced American theologians to re-examine our glib references to eternal burning torment, as well as the nature of God in general, who had allowed the Nazi horrors. Are you sure of your exegesis of scripture on this matter? Have you personally addressed the challenges of the Conditionalists, or are you taking someone else’s word while superficially understanding the theological issues? Are you as a Protestant relying too heavily on tradition, and not Sola Scriptura? Because if you are wrong, as we contend, there may be, as it is said, hell to pay—and trust me, more people stumble into unbelief due to depictions of hell than the believability of the miracles of Jesus or the resurrection. Here, Dr. Mohler’s argument hits an even lower note, stooping to a misinformed ad hominem followed by unsupported claims about what the scripture teaches. Of course I know that a 20 minute podcast can’t unpack those statements in much detail. But here, he is just relying on his appeal to Tradition alone, even to the point of sidestepping the scriptures mentioned in the NYT article. We also have an inner understanding of the requirements of justice, for an absolute justice, and the problem with a finite hell is the reality that our sin is not finite – it is infinite. Every one of our sins and transgressions, biblical defined, is an infinite transgression against an infinitely holy and omnipotent God. But here Dr. Mohler is entirely incorrect. Even many conservative theologians who support ECP have admitted that the doctrine seems counter-intuitive and harsh, and on the surface seems to violate the idea of the proportionality of punishment. In actuality, ECP matches only the intellect of the person who has been indoctrinated or otherwise persuaded against intuition and balance of love and justice with the traditional view on hell. And this is where Traditionalists share ground with Conditionalists: we are concerned not to damage to the balance of justice and mercy, or undermine the justice of God. Sure, Universalists eschew punitive justice (though they might contend otherwise), yet, understood as never-ending torment, Traditionalism skewers mercy on the fire pit of hell, making ‘biblical’ justice seem like a grotesque and cruel despotism. Dr. Mohler, I know you are a busy guy. And I love your thoughtful ministry. But we Evangelical Conditionalists do not take to superficial criticisms, and are willing to joust on the field of exegetical battle as well as philosophical. Our case is strong. We love the lost and the church, and are distressed by the negative impact that an erroneous doctrine has had on both. You have only partly understood the rise of Conditionalism in our day. It’s not only found within liberal circles, but among conservative bibliophiles (for instance, those aligned with Rethinking Hell) who are willing to challenge orthodoxy with scripture. Your own Baptist tradition knows all about this type of reform. It is time for Baptists like yourself to take a more serious look at this, not as a liberal movement, but as a conservative Evangelical concern for the lost, the honor of God, and the Church. 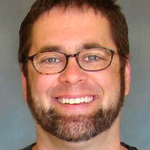 Daniel G. Sinclair is an Assistant Teaching Pastor in a small country church in the Central Valley of California, as well as an M. Div. student at Fuller Theological Seminary. He previously earned a B.S. in Biochemistry from North Carolina State University, and currently pays the bills as a Software Analyst. He can think of nothing more pleasing to do on a sunny Saturday than to stay indoors with a theology tome, a cat on his lap, and a cup of tea, with sugar please. He is aiming at becoming a pastor-scholar, and maintains a theology blog at WholeReason.com, while supporting his lovely wife in her ministry leading a local chapter of MOPS.